One of IPU New Zealand’s business and marketing lecturers, Marveys Ayomi, featured in the 2018 edition of the Indonesian Embassy's annual magazine: INZIST (Indonesia and New Zealand including Samoa and Tonga). This edition highlighted the 60th year of bilateral relations between New Zealand and Indonesia, as well as the President’s visit to NZ in March. Having taught at IPU New Zealand for six years, Marveys is a mentor to Indonesian students on campus. 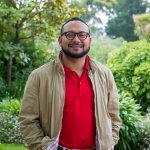 In 2014, he worked with the Provincial Government of Papua and Mr Lukas Enembe, the non-active Governor of Papua, to establish a scholarship programme for high-achieving Papuan students to study at New Zealand universities. Marveys is happy that the programme has been successful in developing Papua’s future leaders. “I am passionate about honouring the existence of people of the land through bringing not just access but extraordinary quality education,” he says.